Scoil Mhuire has been very fortunate in having successive Parents' Associations who believe passionately in the importance of educational provision in their local community. They hold a strong belief in promoting and encouraging their children's learning through access to a broad and balanced curriculum and facilitate this through generous investment in educational resources for the school in addition to support of educational initiatives and programmes. The association hold an annual fundraiser. Its success is ensured by the huge contribution made by the general parental body of our school, our ever generous sponsors and without fail the tenacity, dedication, ingenuity and enthusiasm of the association itself. Our whole school community is very much indebted to all those committee members, past and present, who give so freely of their time and support for the ultimate gain of all connected to Scoil Mhuire, Machaire Áirne. To past and present members we say GO RAIBH MÍLE MAITH AGAIBH, your work and contributions to life in Scoil Mhuire will long be remembered. -provide Fruit Stall and drinks at school Sports Day. Association as their contibution to our school is invaluable. Scoil Mhuire, Magherarney was very honoured to have Mr Brendan Jenkins from Clones Credit Union visit the school recently. 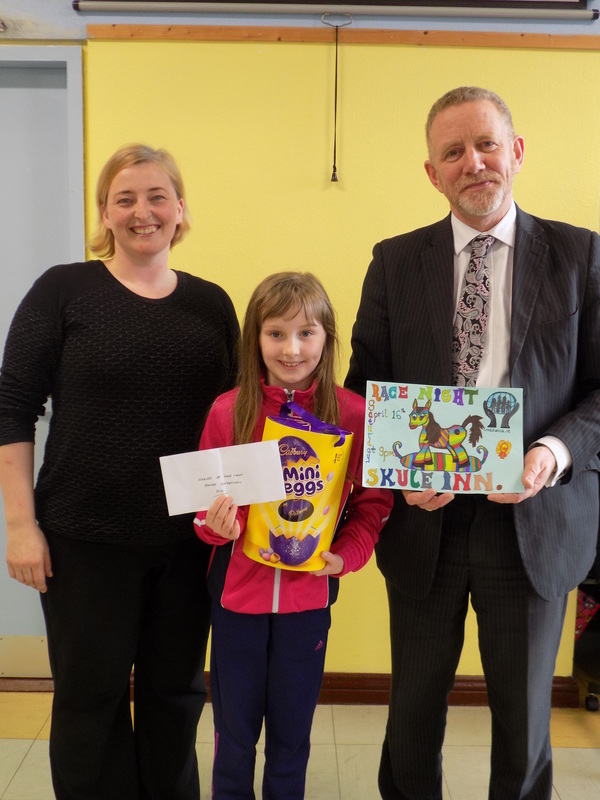 Brendan came to present an award to the winning illustrator in this year’s ‘Design a Cover’ competition which is organised by Scoil Mhuire’s Parents’ Association in conjunction with their Annual Race Night. This year’s main sponsors are Clones Credit Union and they had the very onerous task of judging the entries to the competition. The winning design was by Jenna McQuaid, Rang 4 and will be used as both a poster advertising the event as well as the Race Night booklet cover. Scoil Mhuire’s Race Night takes place on Saturday, April 16th in the Skule Inn, Smithborough.